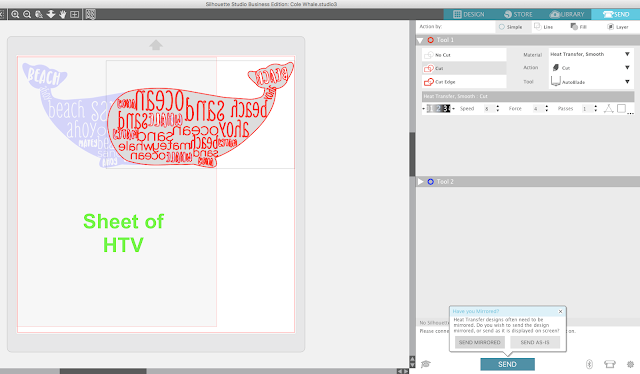 Silhouette Studio will now give you a prompt to mirror your design when any of the heat transfer vinyl materials have been selected in the V4 Send panel. The problem is...it can cause your design to mis-cut if you aren't aware of one very important thing! In response to repeated requests from Silhouette crafters, Silhouette America's software team has added a mirror reminder prompt to the software when any Heat Transfer Vinyl is selected as the material type. 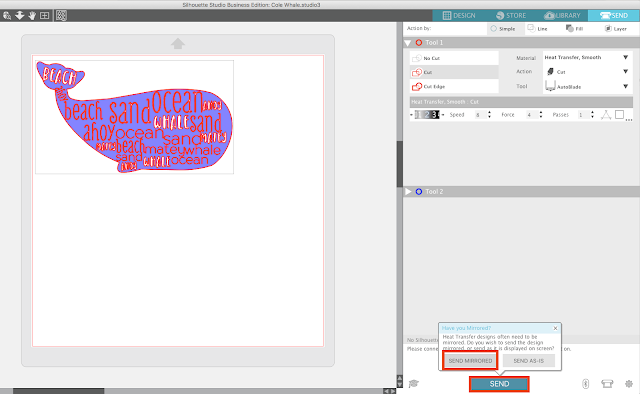 Here's how hit works: when you select any of the "Heat Transfer Vinyl" material types from the material list in the Send panel, you'll get a prompt to mirror your design after clicking the "Send" button. 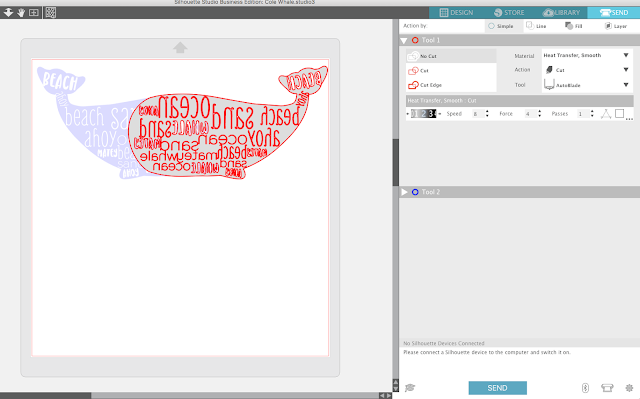 If you have already mirrored your design, you can click "Send As-Is" and go about cutting. But if you have forgotten to mirror, or you just don't want to change the orientation of your design, you can click the option to "Send Mirrored." The prompt itself is the good part...the bad part is the way the software responds. 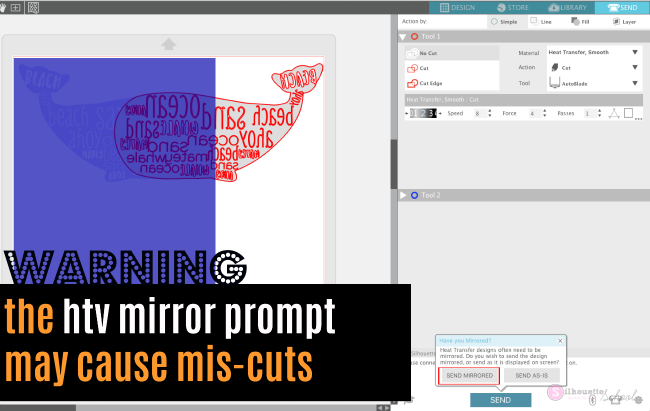 According to the pop up you'd want to pick Send Mirrored "to send the design mirrored" when cutting. The word "design" is where the problem starts. The problem is that's not actually what happens....instead the page is mirrored, not the design. While the preview screen in Silhouette Studio does not change to show you the new placement of the cut, this visualization gives you an idea of how the whale would cut when "Send Mirrored" is selected. If you have a full sheet of HTV it's likely not a big deal. BUT...if you have a design in the upper left corner and a piece of HTV covering the same grid boxes (indicated by the gray shaded area below), you will end up missing the HTV. Instead of the design mirroring or flipping, as the description states - and as most would expect - the entire page flips which puts the design in the upper right corner when it cuts. So while the prompt to mirror the design is helpful if you've forgotten to mirror your design, the "fix" actually causes another "issue" which could very likely end up with the same result: wasted heat transfer vinyl. 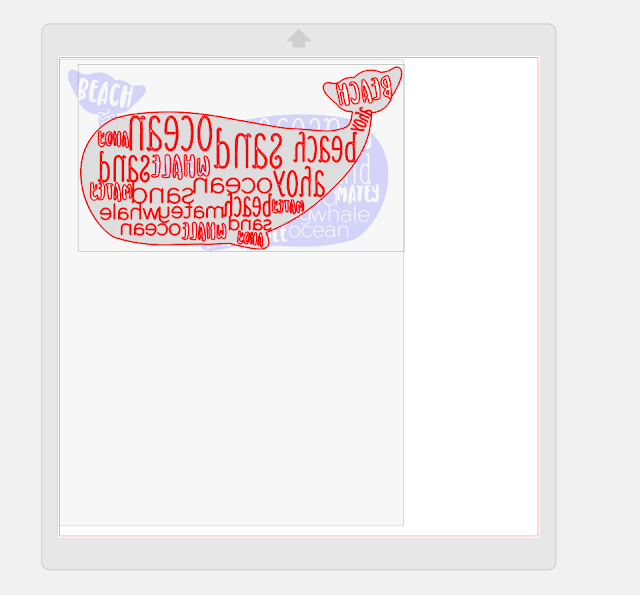 I mean let's be honest if I can remember that my design will not cut where it's shown in the preview screen, then I can probably remember to mirror it myself manually. I like having the reminder, however, I just go back and flip in the design space. The other day I was cutting by color and it didn't mention flipping and of course I had forgotten. Luckily I only wasted about and inch but... Where isn't there a reminder her? Is there a way to turn off the reminder so it doesn't pop up every time you cut HTV? It would be awesome if there was. I just used Vinyl (not HTV) and the stupid reminder came up for that??? What the heck??? Want to thank you for all your great tutorials first off. 2nd I'm not a fan of version 4, I went back to my version 3. I felt lost and didn't like the layout and other things. And now to see this about mirroring, I'll just have to wait till all the bugs are out or just stick to my version. Maybe I'm too stuck in my ways :) but No to version 4 from me at this time. i stick with my v3 too. same reason and ialso i do not need a cloud. avoiding updates is what i do more and more nowadays. Happened to me, a couple of days ago, flipped the design just as you show [wasted product grrrrr!!] I decided the prompt is a good idea, but in future go back and mirror it myself. So everyone TAKE NOTICE OF YET ANOTHER BIT OF GREAT INFORMATION from our super hero. 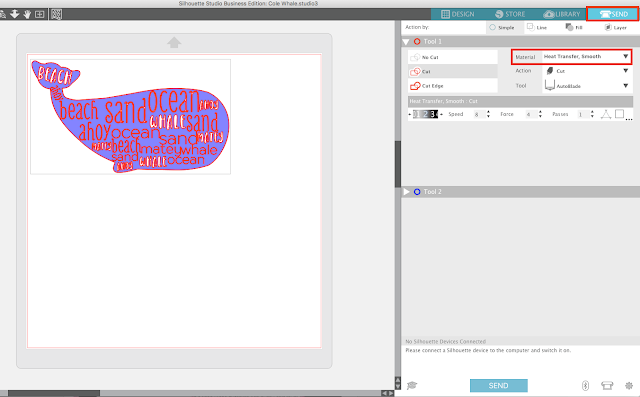 Perhaps Silhouette Studio would be better off just flashing the warning and giving options of "Send as is." and "Thanks! Cancel cut." Thank you for the help you provide to us silhouette users who are learning new things almost every time you post something. I have the SDEPlus with the latest version. I cannot find this "send mirrored" tab. I can mirror images the other ways, but not in "send to" mode. I selected HTV but nothing! Any suggestions? I don't need any reminders. I'm not intellectually lazy. THANK you, thank you, thank you for this post!!! What a terrible, unintuitive design. I've wasted so much HTV and destroyed a cutting mat because of this dumpster fire of a feature "addition".